I was finally getting round to clearing stuff off the iPad and I found this comic that I’d drawn months ago and then completely forgotten to publish!!! The potential to be as true now as it was then. 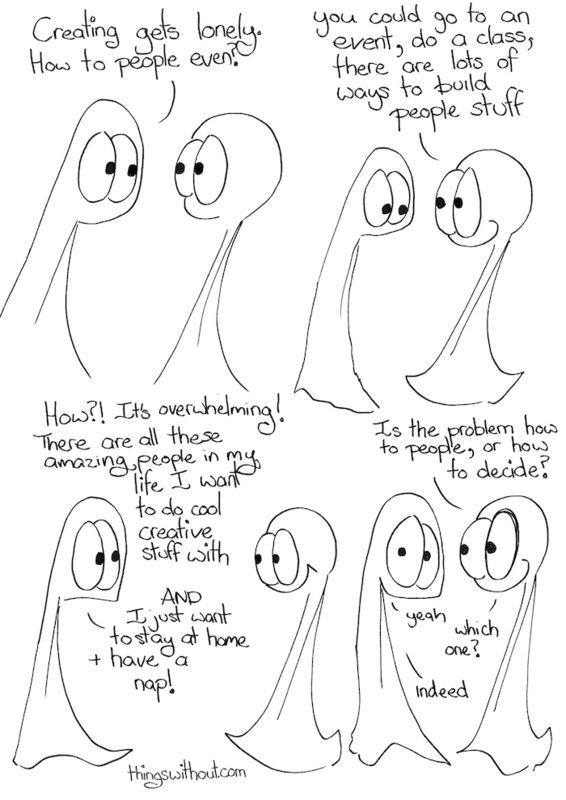 I’m on a pretty good creative and balancing the rest of life kick right now, but I’m not sure we ever fully grow out of how to people even and how to decide, we just get better at battling them! Thing 1: Creating gets lonely. How to people even? Thing 2: You could go to an event, do a class, there are lots of ways to build people stuff. Thing 1: How?! It’s overwhelming! There are all these amazing people in my life I want to do cool creative stuff with AND I just want to stay home and have a nap! Thing 2: Is the problem how to people, or how to decide?